This past Sunday I completed the Spartan 5K Run. 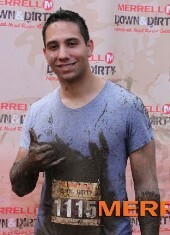 This is the first “mud run” I’ve done. I did a regular 5K back in April. If you view my previous entry you can see a video preview of the event as well as some additional information. Simply put: I had a BLAST! I believe it took me somewhere around 35-40 minutes to complete the course. The only issue I had was that a portion of the race was on pavement and as I learned from the regular 5K back in April, I have trouble running on pavement for an extended period of time. Many years ago I was struck by a car. The car actually impacted my right knee which resulted to damage to the knee. I had to wear a knee brace for months. If I didn’t the knee would pop out of its socket. Since then I’ve had trouble with it. I’m attempting to build up tolerance in that leg but I’m not sure how possible it will be to really run a 5K or even a 10K on pavement without any pain. While I completed the Spartan 5K perfectly fine, I did notice pain towards the end and my knee actually gave out when walking up the steps to my apartment several hours after the event.